Last Wednesday, exactly at midnight, my new nephew and Miles’ newest cousin was born. James Michael is the cutest little man, and has already stolen my heart. Have I mentioned that I love being an aunt? 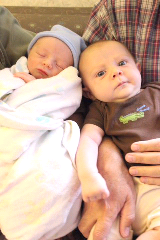 Miles was fascinated by his new little buddy/partner-in-crime. What was amazing to me was how big Miles looked next to James. How they grow! And in ten short weeks! Watching the proud new parents, I was reminded of Miles’ first days. How much we’ve learned since then! I remember being completely overwhelmed then. Actually, I still feel that way. Yet, things are finally starting to “work”. Miles sleeps better at night, the colic is behind us, nursing troubles are long past, and, most of all, we have learned how to meet the unique needs of our little boy. We have learned that good parents learn how to meet their child’s needs instead of trying to conform him/her to their preconceived notions. Oh, how I love watching him change and grow! I love looking down to see his sweet little smile and that twinkle in his bright blue eyes! Somehow, when you relax and let your baby become the little person they are meant to be, parenthood becomes a lot more enjoyable.